I suppose having a small band onstage that interact with the cast could work, but they would have to be costumed, and separate characters from the rest, not singing (other than chorus for those instruments that don't require a mouth) and no dancing. It would also need to be re-orchestrated for a small band that could fit scattered on the stage, or have a token few musicians onstage, and the rest of the orchestra backstage. But CATS has large dance numbers so there would be no "cats" available to play instruments. And the frequent dance routines are taxing of the actors' energy not to mention that CATS is a sing-through. So, it might have to be a separate cat orchestra who just play instruments or limit the number of dancers and singers for each scene. But that would come close to being "CATS in Concert". Yeah, I suppose it's a bad idea. I will agree about the simplicity of certain shows. 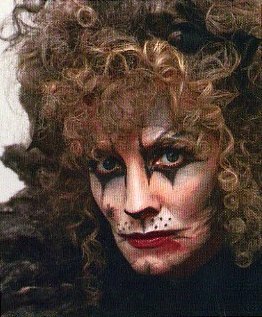 CATS has only the barest plot to start with. Sorry if this seems off topic. CATS is a dance show/revue, so I really get annoyed when people say "it doesn't have a plot, therefore it's bad". It doesn't need one, for what it is. I don't think it's fair to compare it to something like Phantom, only given that one is more of a traditional musical, and the other is a dance show, as I said.